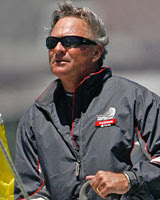 Crack syndicate Emirates Team New Zealand is down to only "four or five" people, says former director of sailing Rod Davis, one of the latest casualties as the cost of prolonged America's Cup court action bites deep. Davis has been "let go" as the legal wrangle between BMW Oracle and holders Alinghi continues to exert financial pressure on would-be Cup challengers. While coaching the New Zealand Olympic yachting team in Qingdao last month, Davis received the news that his job as Team NZ director of sailing was over. However, while the timing was unfortunate, Davis was philosophical about the inevitability of the move. "You know, I can't really fault Team NZ in this position. It's been remarkable that they hung on to people as long as they did," said Davis. "You just can't keep going on forever in an uncertain world. "Team NZ has ceased America's Cup operations for the time being, so pretty much everyone has been released or made redundant or whatever you want to call it," said Davis. "Darn near everyone has gone now; there's only four or five people left, I think."